The Fish Industry Training Association (Highlands & Islands) delivers a twice yearly, three week long Introduction to Commercial Fishing course at their training room at Dunstaffnage Marina, north of Oban. The December 2015 course was attended by 12 would-be fishermen/women from all airts and pairts! (Argyll & Bute, Ayrshire, Caithness, Glasgow & Ross-shire) The 10 men and 2 women ranged in age from school leaver to early 50s and all got on and successfully completed the 15 day course. FITA is delighted to receive funding through Seafish for this course which is open to anyone that would like to make fishing their career. The course encompasses all aspects of a successful and safe career aboard a fishing vessel - regardless of boat size or fishing method. The candidates receive practical training in knots, splicing, mending & creel making, along with classroom sessions and industry talks. 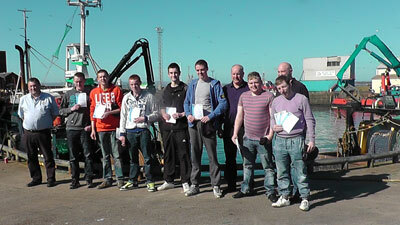 During the final week of the course candidates complete their mandatory fishing safety certificates. For more information and future course dates, contact Lachie Paterson on 01583 431570 (office) or 07771 681428 (mobile). From 1 June the Seafish Industry Authority will resume its full programme of funding support for commercial fishermen undertaking voluntary (safety-related) training. The Maritime & Coastguard Agency (MCA) offered Seafish continued funding of £250k per annum for three years, conditional upon Seafish securing additional funding via the European Maritime & Fisheries Fund (EMFF). With EMFF still some way off being launched, the Seafish Board, at its recent meeting, approved the emergency use of levy to start match funding the MCA’s contribution to enable this important fishing safety initiative to be restarted. This interim arrangement will bridge the gap until EMFF opens. New entrants to the fishing industry recently successfully completed the Seafish-funded Introduction to Commercial Fishing course in Troon. The Fishermen’s Mission provided support throughout the course which was run by FITA’s Lachie Paterson. The course consisted of two weeks shore-based training (covering safety, gear and catch handling, net mending, rope work, engineering and navigation) and one week of mandatory safety courses (Sea Survival, Fire Fighting, First Aid, Health and Safety) and the Seafish Basic Fishing Vessel Stability course. Local skippers have offered to take the new fishermen on board to help them find their sea legs. Thanks to David Linkie Fishing News for Article and Photo. FITA’s Lachie Paterson ably assisted by John Fulton of the RNLI delivered a Seafish-sponsored three week course for new entrants to the fishing industry in Troon from 31 March to 18 April with the seven participants achieving success in their final assessments. South Ayrshire Council and the Fishermen’s Mission were very keen to encourage training for the industry and Douglas Hashagen, Allan Swan and Peter Hunter from South Ayrshire were instrumental in selecting candidates for the course and providing induction training. 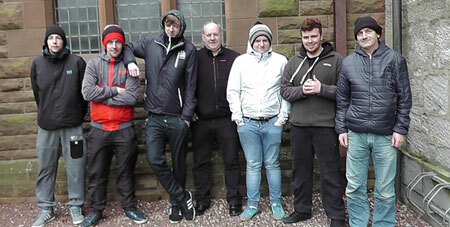 Steven Hutchison, Ryan Christison, Jon McGiffen, Jason Telfer, Kyle Geddes, Chris Boyd and Brendan Gillespie were very keen students on the course which was wide-ranging. It included shore-based training covering safety, gear and catch handling, net mending, rope work, navigation and boat handling. The mandatory basic safety courses of sea survival, fire fighting, first aid, health and safety and a further fishing vessel stability course were also included. The trainers were delighted with the enthusiasm and hard work displayed by the group and look forward to this being the first of a series of such training opportunities in the area, with long-term benefits to the industry. The new fishermen are already enjoying the next stage of their new career, testing their sea legs with local skippers fishing from Troon harbour. Nine candidates participated in this course and were as diverse as usual from a soon to retire Army Major wanting to be a creel fisherman to an Ayrshire DJ looking for a change of direction! ‘My son, Lewis MacMillan, from the Isle of Bute, has just completed a three week Introduction to Commercial Fishing course held at Oban. We were delighted with the training that was provided, it was of the highest standard and the tutor, Lachie Paterson, delivered a course that was in my son's words, simply perfect! He has returned home to tell us that he had the best three weeks ever! He is very committed to entering the fishing industry and found that the course was well thought out and covered all aspects required for the industry. I can't recommend this course highly enough and the contacts we had, Lachie and the ever helpful Sheila, went above and beyond! The fact that Lachie was a highly respected and knowledgeable former fisherman, made him an ideal person to pass on his vast experience of this industry. I know that all the other students felt the same. The latest group of the next generation of fishermen completed their new entrants course last week at Dunstaffnage Marina, Oban, under the guidance of FITA’s offshore training coordinator Lachie Paterson. The Fish Industry Training Association (Highlands & Islands) was formed on 22 November 1990 as a result of the merger of 2 training organisations in the Highlands & Islands -- Highlands and Island Fish Processors Association and FITA. On 11 February 2005 the Fish Industry Training Association (Highlands & Islands) Limited – FITA - was incorporated as a company limited by guarantee having been formed as a successor to and to carry on the business and activities of the Fish Industry Training Association an unincorporated Association. FITA’s Board of Directors represents different sectors of the fisheries industry. The Chair is Robyn Dutton from Ullapool with Sandy Patience of the Fishermen’s Association Ltd being the Vice Chair. Affiliated to Seafish, Improve Ltd (Food & Drink Sector Skills Council) and SQA (an Approved Centre for the delivery of SVQ’s in the onshore sector) FITA is a specialist organisation providing and promoting training, learning, skills and qualifications along with technical advice, resources and services, for companies, business and individuals in all sectors of the fish industry in the Highlands & Islands and beyond. The delivery of the 4 mandatory courses and the under 16.5 m courses sees Training Co-Ordinator Lachie Paterson travelling the length and breadth of the Highlands & Islands. During June and December each year FITA’s main training focus is the 3 week Seafish Introduction to Commercial Fishing Course for new entrants to the industry. This comprehensive and interesting course includes all the mandatory Seafish certificates i.e. 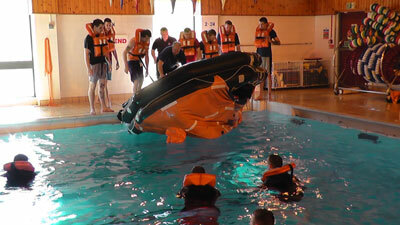 Sea Survival, Fire Fighting, First Aid and Health & Safety for new entrants. The first week of the new entrants’ course is devoted to the risks and responsibilities of working on a fishing boat when trainees are made fully aware of the dangers of life at sea. Trainees are also introduced to mobile and static gear methods, rigging and equipment, and procedures onboard fishing vessels. 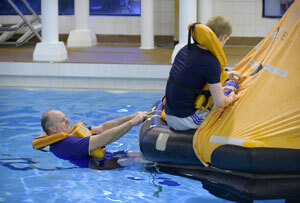 Theory and practical sessions are interspersed throughout the course to keep candidates engaged and interested. A whole day is devoted to ropes, splicing and knot work and two days to net and creel construction and practical net mending skills. The youngsters are left in no doubt about the length of time they would spend at sea on these mundane but vital tasks. In week 2, trainees study navigation, meteorology, effective watch keeping and emergency procedures. They are also introduced to the workings of diesel engines and vessel operations and maintenance. An introduction to boat handling theory is supplemented with an optional practical session and a visit to a fishing vessel. Fish identification, handling and storage procedures are studied as well. Each topic ends with a review and assessment. Mandatory certificates are covered in Week 3, including sea survival, fire fighting and prevention, first aid, and health and safety. “A good example of current training provision is the continuing work being done by the Fish Industry Training Association. Harnessing such elements will help to provide the necessary well trained, knowledgeable and reliable crew at the heart of vessel businesses and to provide the essential skills and continuity required” Scottish Fisheries Minister Richard Lochhead, Fishing News 14th September 2102. FITA would like to thank Fishing News Oban for allowing the use of this material. Fishing News of 14 September 2012 reported that Scottish Fisheries Minister Richard Lochhead (right) had praised the training work being carried out by FITA. Following the ending of the concession on 31 August that allowed non-EEA crew to work on board fishing vessels operating within territorial waters, Mr Lochhead said in a letter to the Scottish industry Fisheries Management and Advisory Group. “A good example of current training provision is the continuing work being done by the Fish Industry Training Association. Harnessing such elements will help to provide the necessary well trained, knowledgeable and reliable crew at the heart of vessel businesses and to provide the essential skills and continuity required. 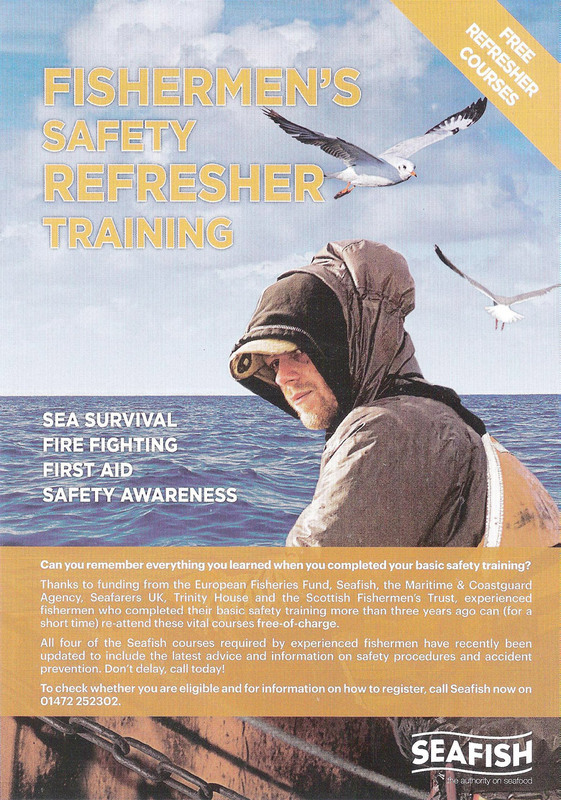 Thanks to funding from the EFF, Seafish, the MCA and the Scottish Fishermen’s Trust, experienced fishermen who completed their basic safety training more than 3 years ago can (for a short time) re-attend these vital courses free of charge. All four of the Seafish courses required by experienced fishermen have recently been updated to include the latest advice and information on safety procedures and accident prevention.